As you can see both the baseband and the audio SNR is rather good. I suspect the recent gain improvements in the driver have something to do with it. During this experiment I have used my Arrow II satellite antenna; however, for a permanent installation a Quadrifilar Helix or a Turnstile antenna would be better. 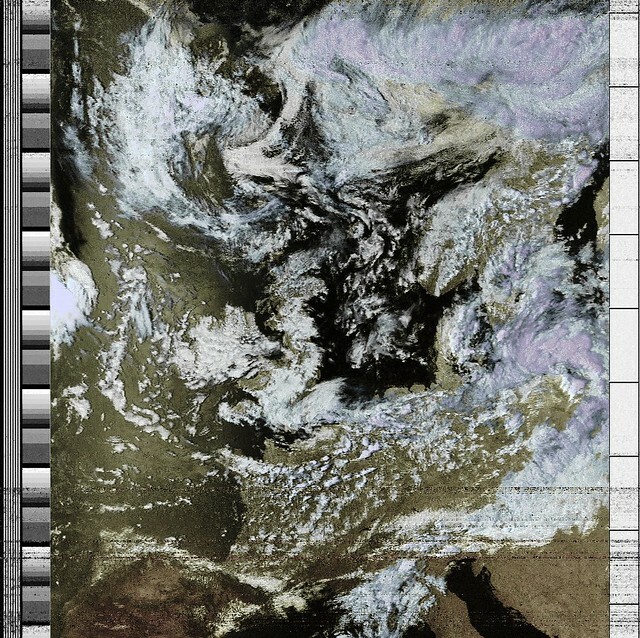 Use the proper FM deviation (17 kHz) and filter width (45 kHz). Use proper gain setting for max SNR. With the latest rtl-sdr I had to use max gain setting. Use a sample rate that works well with your device on your computer (I used 1024 ksps). Record to audio to a WAV file. Resample the audio to 11.025 kHz. 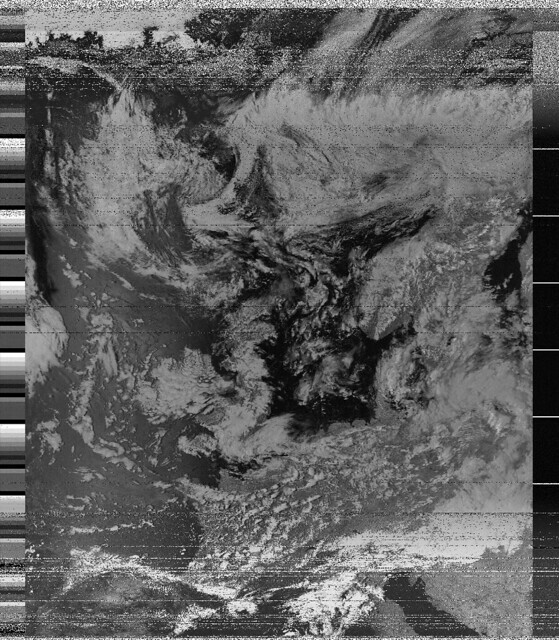 Decode the image from the audio using atpdec or wxtoimg. The image was captured during a late afternoon pass, which is a good time for APT reception, because we can often see shadows beneath the clouds, giving the image a sense of 3D. You can now clearly see the landmass and the clouds, as well as the reflection of the Sun on the surface of the ocean. I hope this demonstrates that RTL SDR devices do have practical applications. At $20 the rtlsdr is pretty much the cheapest NOAA APT / satellite communication receiver I have ever had.